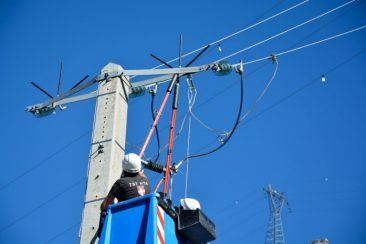 The four species of vultures occurring in the Mediterranean are among the most threatened in the region and electrocution on energy pylons is one of the causes of mortality for all species. Electrocution occurs when vultures perch on poorly insulated medium-tension electricity pylons, particularly those that have a design which make it easier for the bird to touch the cables and the pylon at the same time. This threat is not that complex to mitigate, as the insulation of cables in high-risk poles is relatively easy and inexpensive, but requires a huge effort to identify the most dangerous sites and to prioritize mitigation action, besides getting the electric companies and administrations aware of the problem and engaged on action. In the long term, selecting pole designs that are less dangerous, or even burrowing lines in high-biodiversity areas seem better options. MAVA is funding a programme for the conservation of threatened birds in the region that complements several projects currently run by the Vulture Conservation Foundation (VCF) across the Mediterranean, and that all try to minimise the threat of electrocution. These include LIFE-funded projects such as LIFE Rupis, Vultures Back to LIFE, LIFE GYPHELP and LIFE Re-Vultures. The Vulture Multi-species Action Plan, co-developed by the VCF, BirdLife International and the IUCN Vulture Specialist Group, and endorsed unanimously last year by all signatory parties to the CMS (Convention for Migratory Species), identified the often overlooked threat posed by electricity infrastructure, particularly electrocution and collisions, as a significant global threat to vultures. To tackle these threats involves bringing together a variety of agencies together to share information, something the MAVA is also promoting. One of the examples contributing to this programme was the training seminar recently organised by the Spanish Junta de Andalusia for governmental environmental agents, to share knowledge and practical sessions to explore this threat. Read more about MAVA’s action plan on reducing the mortality of migratory birds and vultures.